Be the first to share your favorite memory, photo or story of Jack. This memorial page is dedicated for family, friends and future generations to celebrate the life of their loved one. 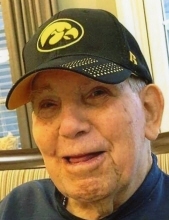 Jack L. Lewis, age 88, of Council Bluffs, passed away Tuesday, April 9, 2019 at Country House. Jack was born on October 6, 1930 in Atlantic, Iowa to the late Lafe and Ruth (Wright) Lewis. He served his country in the US Army during the Korean Conflict. Jack married Nancy Shuffler on October 24, 1954. He worked as a Steam Fitter for Local 464 Steam Fitters retiring in 1996. He was a member of Local 464 Steam Fitters Union. He was preceded in death by wife, Nancy (1997) and 2 brothers. He is survived by 8 daughters, Becky and Dennis Walker; Linda and Tracy Stubbs; Janet Lewis; Mary Lewis; Kim and Dan Beckner; Barb and David Fichter; Margie and Jerry Gonzales; Kathy and Randy Schmitt; son, Brad Lewis; 18 grandchildren; 39 great-grandchildren; 8 great-great-grandchildren; sisters, Marjorie and Clyde Miller; Jeannie Peterson; brothers, Lynn and Linda Watson; Bob and Verna Watson; Jerry and Jeri Watson; nieces, nephews and other relatives. To send flowers or a remembrance gift to the family of Jack L Lewis, please visit our Tribute Store. With military honors by American Legion Rainbow Post #2. "Email Address" would like to share the life celebration of Jack L Lewis. Click on the "link" to go to share a favorite memory or leave a condolence message for the family.